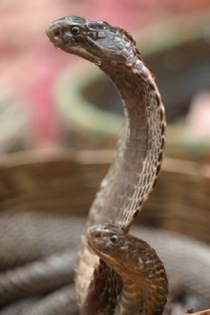 A staring contest with a spitting cobra. eyes of predators, debilitating and often blinding animals many times their size from up to ten feet away. So when it came time for Young to choose a target to use in order to study how cobras hit their targets' eyes with such accuracy, it seemed only natural to choose... his own face. Because, really, what else would you choose? Young was studying the evolutionary history of cobras when he began to notice an interesting byproduct of the cobras' constant spitting in his direction. The venom trails that dried on the glass walls of the cobra tanks formed varied and beautiful geometric patterns. Cobras store venom in glands hidden just behind their eyes, and when they spit, they flex powerful muscles that force the venom out through long, thin fangs. But unlike the cobra's target, the fangs can't move. How could these complex patterns of venom form, and even more impressively, how could the cobras hit their targets with an accuracy rate over ninety percent? Young reasoned it must have something to do with head movements, but he wanted to know more. His solution was to simultaneously track the movements of the cobra and its prey with a series of high-tech cameras. The prey in this case was, of course, Young's own head. To prepare for the face-off with the cobra, he wore a visor equipped with a computer chip to record his movements, and covered with a thin sheet of plastic so he could observe the patterns the venom formed when the cobras spat at him. He then proceeded to--in his own words--"taunt the snake" to get it to spit at his face. After the adrenaline rush subsided, Young and his team analyzed the data from the snake's movements, his own movements, and the patterns of venom on the visor to put together a complete picture of how the cobra was able to overcome the odds and spit successfully. At first, when Young was moving slowly back and forth, the snake's movements matched Young's. The cobra was simply tracking him. But when Young made a sudden jerky movement, the cobra would spit. Young explained that a quick change of direction meant the cobra could predict where its prey's head would be by the time the venom got there. In order to make up for the time needed to react to the prey's movement, the cobra had to rapidly switch from just following its prey to predicting where it would be in the future. The different patterns of venom that appeared on the plastic sheet reflected the snake's quick predictive movements. Much like shaking a garden hose can make different patterns of water even though the nozzle remains the same shape, the patterns of venom differed depending on how the snake was moving at the moment of spitting. Fortunately for us, cobras are actually rather reluctant to spit at people. They would rather save their venom for something they view as a real threat. Young describes getting the cobra to spit at him as a bit of an art: He has to be just close enough to be a threat, but not close enough to be bitten. A beautiful balancing act, perhaps, but one we're more than willing to leave to the professionals.